Glider technicians David Aragon and Tina Haskins from Rutgers University checked internal systems and ballasted (or stabilized) one of two new BIOS gliders prior to their upcoming deployment in Bermuda waters. 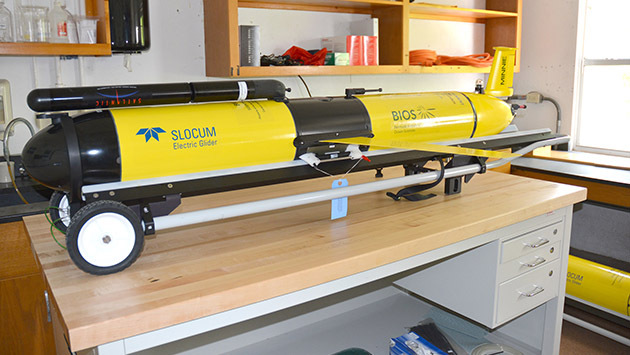 Two new underwater gliders arrived at BIOS in mid July and are expected to be gathering data in the waters around Bermuda by the end of the summer. The gliders, each resembling a 6-foot-long airplane, operate on battery power at sea with direction from land-based researchers while carrying a payload of sensors that measure ocean properties such as salinity, temperature, oxygen, nutrients, and currents. Researchers use the data to more accurately map the ocean’s ever-changing currents, study the processes controlling biological productivity, and decipher the effects of climate change and intense storms. The gliders, named Jack and Minnie, arrived nearly a year after BIOS acquired its first autonomous glider, named Anna. Physical oceanographer Ruth Curry, who oversees the glider program at BIOS, says the trio of gliders will each have their own responsibilities that will complement the work of the others. 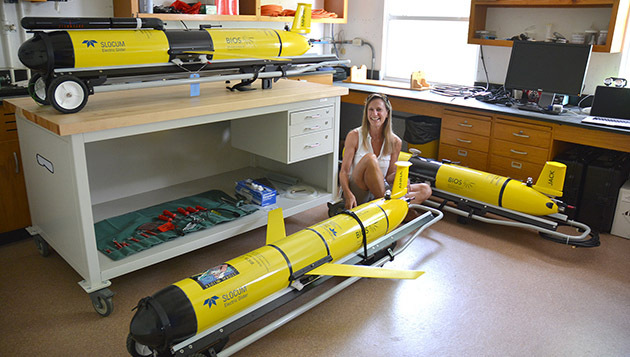 Physical oceanographer Ruth Curry, who directs the glider program at BIOS, examined the new gliders (Jack, to Curry’s left, and Minnie, on table) in her lab this month before ballasting work began. With them is the BIOS glider Anna, which has been working in Bermudian waters for nearly a year. In the weeks ahead, Curry and her team at BIOS will make sure the gliders are stable in the water, a process known as ballasting, then deploy them offshore of Bermuda, where Anna has been working over the past year. “We plan to run Minnie and Jack on side-by-side missions for about two to three months at a time,” Curry said. “I want them to catch the seasonal transition of the ocean in this part of the world from summer to fall, and from winter to spring.” Deploying multiple gliders at one time allows researchers to acquire very detailed information needed to understand the complex workings of the ocean, which is affected by seasonal wind and weather, as well as longer-term climate changes. One glider provides a single view, but multiple gliders together provide larger scale views, enabling researchers to piece together the intricately woven undersea picture. 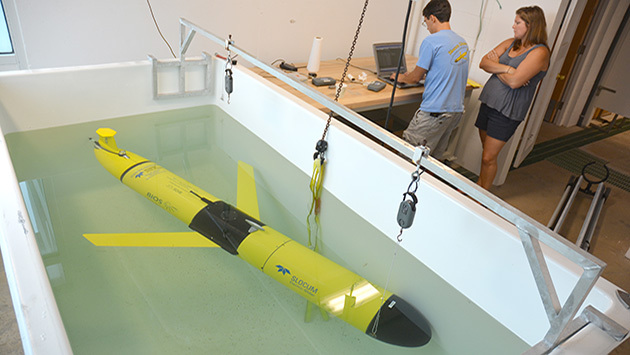 The gliders, manufactured by the Massachusetts company Teledyne Webb Research Corporation, are controlled by land-based researchers at various institutions around the world. Scientists like Curry pilot the vehicles from computers or mobile devices, sending instructions via satellite to direct them along desired tracks. The gliders dive and climb continuously in a see-saw pattern acquiring data from the surrounding water using internal and externally-mounted sensors that measure the physical and chemical properties of ocean features. The gliders surface at pre-programmed intervals to transmit their data by satellite to a shore-based lab, where scientists analyze the data and can adjust the mission by sending a new set of instructions to the gliders. Like airborne gliders, these ocean gliders have no propeller but use aerodynamic wings to “fly” through the ocean. Batteries power a pump that changes the glider's volume and buoyancy—by pushing oil into or out of an inflatable compartment—and causes the vehicle to alternately rise or sink. The wings give the vehicle forward motion, and a movable tail rudder enables it to be steered left or right. Gliders like these operated by BIOS are revolutionizing oceanography by increasing the amount of data acquired at a fraction of the cost of traditional technologies. While satellites provide global views of the ocean’s surface, and ship and mooring-based observations provide information at particular sea locations, the complexity of the ocean requires higher resolution measurements in both time and space. Gliders, which dive from the sea surface to depths up to 3,000 feet, can travel about 15 miles a day and may cover thousands of miles on a single deployment. Compared to research ships they are relatively inexpensive to operate and maintain, and—unlike humans—they can work 24 hours a day for weeks at a time without a break, and in the face of turbulent weather conditions, such as hurricanes. All are equipped with a CTD sensor (for conductivity, temperature and depth), oxygen sensors, and optical sensors that determine chlorophyll levels using fluorescence. This allows researchers to measure the changing abundance of microscopic marine organisms in the water. BIOS glider with nitrate sensor to measure nutrients. Though operating as a team, each glider has specialized capabilities. Jack has been additionally outfitted with an instrument known as an Acoustic Doppler Current Profiler, or ADCP, which will provide detailed measurements of ocean current strength and structure. Minnie is equipped with a state-of-the-art nitrate sensor to measure nutrients. Together these measurements will enable researchers to address long-standing questions about biological productivity that supports the entire marine food web, and the ocean’s role in drawing down carbon dioxide from the atmosphere that affects the rate of greenhouse warming. The gliders are part of a BIOS program known as the Mid-Atlantic Glider Initiative and Collaboration, or MAGIC, which began with Anna’s arrival last year. This technology has already significantly enhanced BIOS’s research and educational capabilities, and will propel important scientific advances in the coming months and years. The establishment of MAGIC was made possible by the generous support of the Grayce B. Kerr Fund of Easton, Maryland. The gliders Anna and Jack were named for two young siblings in the Kerr Family. Funding for Minnie was generously provided by the Simons Foundation of New York, New York. The Simons Foundation selected the name to honor Marilyn Simons’s great-grandmother Minerva, whose nickname was Minnie.